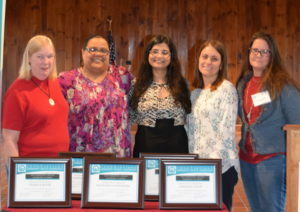 2017 Leadership Academy Graduates iclude: Patricia Blank, Nilanjana Chowdhury, Lorraine Colon, Joanne Hyndman, and Kim Weaner. 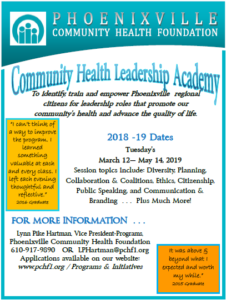 The Community Health Leadership Academy is jointly sponsored by the Phoenixville Community Health Foundation and the Chester county Community Foundation. The mission is to provide a vehicle to identify, train and empower greater Phoenixville area citizens for leadership roles that promote our community’s health and advance its quality of life. Develop leadership skills that will enable participants to affect change in the community. Click image to view, download printable flier. The Community Health Leadership Academy accepts a maximum of fifteen (15) students annually to participate in a curriculum of ten (10), 2 hour, classroom-based learning sessions. The curriculum also incorporates an individual community project completed by each participating student. A stipend of $500 is available to each student successfully graduating from the Leadership Academy, to assist with the completion of this project. The Community Health Leadership Academy is offered once per year. Beginning with the 2018-2019 Foundation year the Academy will be offered during the Spring of 2019. Please contact the Foundation for more information. Application/Enrollment dates are posted annually.